Retiring abroad is the hot new trend in retirement planning. Numerous guides and resources encourage new retirees to embrace a low-cost, low-stress lifestyle in another country where, expatriates say, it’s possible to get inexpensive medical care while saving pension money for a rich cultural experience. And many of these retirement guides recommend buying property in the country of choice as a full or part time residence, an investment alone, or both. While investing in income property for retirement is a smart move for financial stability, many retirees looking for a way to save money by living outside the country end up trapped in the pitfalls that often accompany investing in foreign real estate. And even though prices may be attractive, buyers may face obstacles with finding reliable real estate professionals, getting funding, and maintaining the property they eventually purchase. One reason foreign property is attractive to Americans is that it offers a place to put assets that would otherwise be severely taxed at home – just as foreign investors frequently choose to purchase US real estate for similar reasons. But those who can’t simply pay cash for a home outside the country may run into financing problems. Mortgage lending may be limited, and rates and fees may be higher for foreigners. Currency issues, local laws and taxes may also nibble away at what appeared to be a very good deal on paper. A third problem for American retirees purchasing foreign real estate involves infrastructure. Although a villa in the Ecuadorian countryside sounds delightful, outside major cities, services are limited and emergency response is slow, so building in contingencies for crises has to become a part of the budget. Likewise, finding the resources for ongoing maintenance and general upkeep can be problematic, expensive, or both. Some retirement planning experts advocate renting a dwelling in the country you’re interested in for at least six months before buying property – or keeping a residence at home as well, and renting out both properties for part of the year. 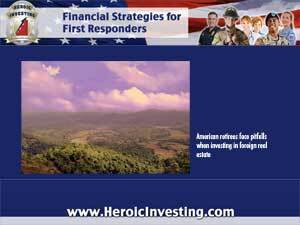 Both options can offer a safety net in case the foreign retirement plan runs into problems.